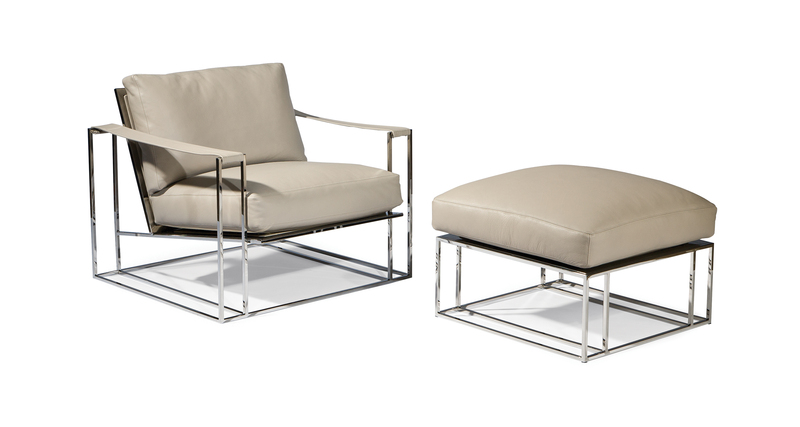 Originally designed by Milo Baughman in 1972, the Sling Chair and ottoman will provide modern comfort to any interior. Available with a polished stainless steel, brushed bronze or satin brass tubular base, the Sling Chair features down-filled, double-stitched cushions for extra comfort and durability. Thoroughly modern and forever timeless, the Sling Chair with its iconic "sling" arms brings comfort, refinement and elegance to any room. Select any fabric or leather from our in-house curated collection for upholstery or provide COM. Frame also available in brushed bronze as No. 1250-103-B or satin brass as No. 1250-103-SB.